Item description: Letter, dated 4 December 1863, from J.D. 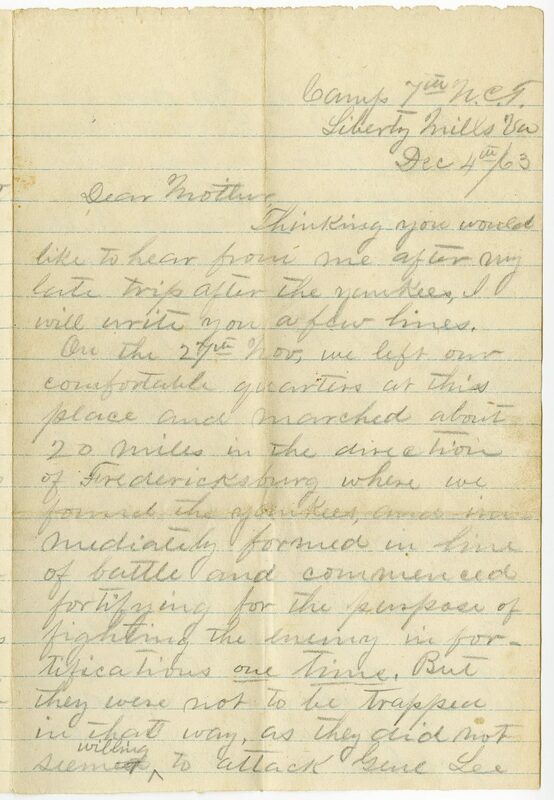 Joyner to his mother in Franklinton, N.C. He discusses an engagement with Union troops near Fredericksburg, Virginia, in which the Union forces retreated from General Lee’s advance, as well as his disappointment with the Tennessee campaign. 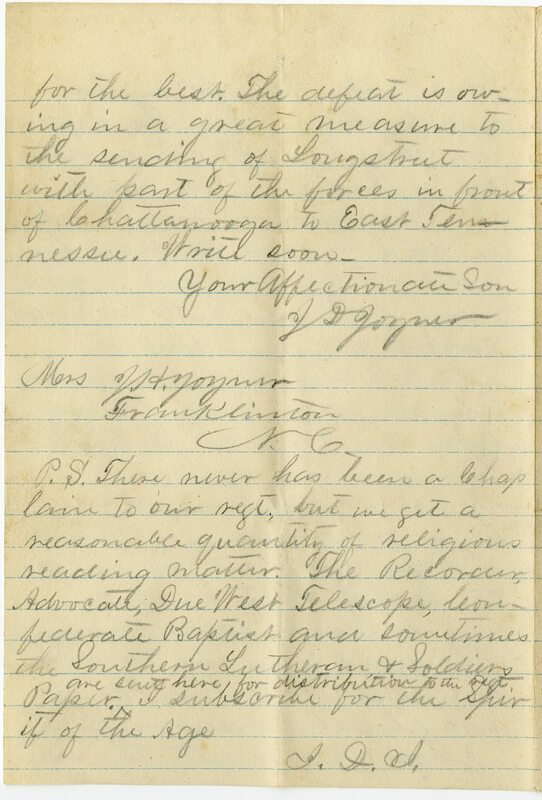 Item citation: From folder 14 in the Joyner Family Papers, Southern Historical Collection, Wilson Library, University of North Carolina at Chapel Hill. Thinking you would like to hear from me after my late trip after the yankees, I will write you a few lines. On the 27th Nov, we left our comfortable quarters at this place and marched about 20 miles in the direction of Fredericksburg where we found the yankees, and im-mediately formed in line of battle and commenced fortifying for the purpose of fighting the enemy in for-tifications one time. But they were not to be trapped in that way, as they did not seem willing to attack Genl Lee in a position of this own choos-ing as he (Genl Lee) has always done. Lee after waiting until his patience was well nigh exhausted, determined on the night of the 1st Dec. to at-tack them next day, and commenced preparing accor-dingly. 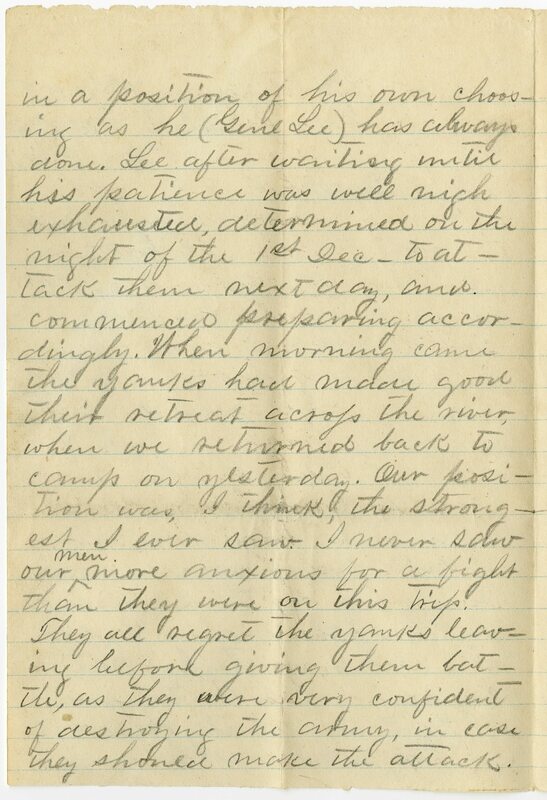 When morning came the yanks had made good their retreat across the river, when we returned back to camp on yesterday. Out posi-tion was, I think, the strong-est I ever saw. I never saw our men more anxious for a fight than they were on this trip. 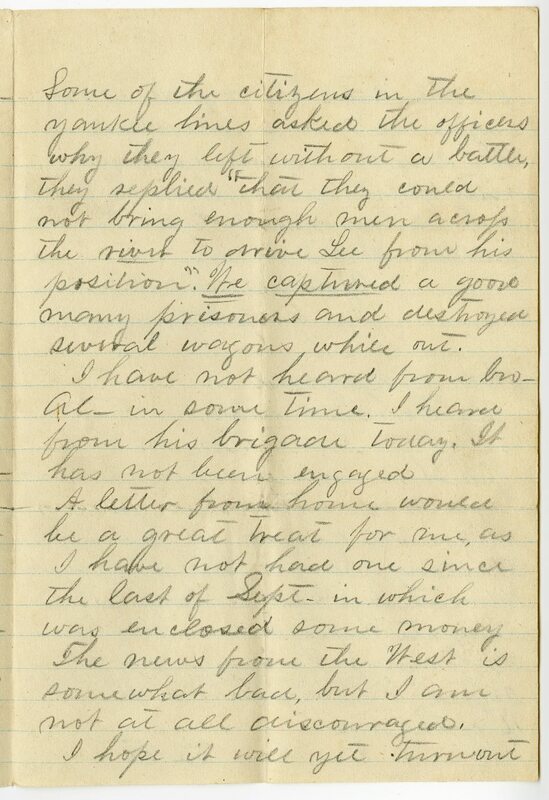 They all regret the yanks leav-ing before giving them bat-tle, as they were very confident of destroying the army, in case they should make the attack. Some of the citizens in the yankee lines asked the officers why they left without a battle, they replied “that they could not bring enough men across the river to drive Lee from his position.” We captured a good many prisoners and destroyed several wagons while out. I have not heard from bro. Al. in some time. I heard from his brigade today. It has not been engaged. A letter from home would be a great treat for me, as I have not had one since the last of Sept. in which was enclosed some money. The news from the West is somewhat bad, but I am not at all discouraged. I hope it will yet turn out for the best. The defeat is ow-ing in a great measure to the sending of Longstreet with part of the forces in front of Chattanooga to East Ten-nessee. Write soon. P.S. There never has been a Chaplain to our regt, but we get a reasonable quantity of religious reading matter. The Recorder, Advocate, Due West Telescope, Con-federate Baptist and sometimes the Southern Lutheran & Soldiers Paper are sent here for distribution to the rest. I subscribe for the Spirit of the Age. This entry was posted in Southern Historical Collection and tagged engagements, Fredericksburg (V.A. ), newspapers. Bookmark the permalink.